Bobby Mackey, who's a well known country artist, fell in love the first time he laid eyes on this old, abandoned building. Until that moment, he had never thought of being a night club owner, then, it became his driving force. His wife, Janet, wasn't quite so sure, because the enormous, dusty, old building felt very unfriendly to her. Of it's ghostly residents, some had been waiting for Bobby to come back. Others had a particular dislike for pregnant women, and Janet, then, was four months along. This non-fiction account of the paranormal encounters in and around Bobby Mackey's Music World is bone chilling. The building where the nightclub is now located has a long and bloody history in the area, from its origins as a slaughterhouse to its tangible link to one of the greatest ghost stories of southern Indiana. It was constructed back in the 1850’s and was one of the largest packing houses in the region for many years. Only a well that was dug in the basement, where blood and refuse from the animals was drained, remains from the original building. The slaughterhouse closed down in the early 1890’s, but legend has it that the building was far from abandoned. According to the lore, the basement of the packing house became a ritual site for occultists. The well was used to hide the remains of small animals that were butchered during their ceremonies. Apparently, a small satanic group made up of local residents gathered at the empty building, managing to practice their rituals in secret. However, they were exposed in 1896 during one of the most spectacular murder trials ever held in northeast Kentucky. It was so large that tickets were sold to the hearing and more than 5,000 people stood outside the Newport, Kentucky courthouse for information about what was taking place inside. The trial, and the murder that spawned it, has become an integral part of Bobby Mackey’s haunted history. Pearl Bryan, the daughter of a wealthy farmer, was an attractive, young woman who lived in Greencastle, Indiana in 1896. She was the youngest of 12 children from a prominent family and by the age of 22, was one of the most popular girls in the area. She had graduated from Greencastle High School in 1892 and had more than her share of suitors. Unknown to her friends and the polite members of Greencastle society, Pearl was pregnant. Her cousin and close friend, William Wood, had recently introduced her to Scott Jackson, who was then attending the Ohio College of Dental Surgery in Cincinnati. He and Wood, who was then attending medical school at DePauw University, became close friends but unbeknownst to Wood, Jackson was an alleged member of the occult group that met the former slaughterhouse in Wilder. Jackson’s family was as well-to-do as the Bryan’s and so he was immediately accepted as a suitor for Pearl. He soon seduced her however and she became pregnant. Pearl turned to Wood, who in turn, informed Jackson of the problem. He made arrangements to remedy the situation with an abortion in Cincinnati. Pearl left her parent’s home on February 1, 1896 and told them that she was going to Indianapolis. Instead, she made plans to meet with Jackson and his roommate, Alonzo Walling, in Cincinnati. It would be the last time that her parents would ever see her alive. She was at that time five months pregnant. Jackson’s medical skills were apparently much more inept than he had led his friend William Wood to believe. He first tried to induce an abortion using chemicals, apparently cocaine. This substance was later discovered in Pearl’s system during an autopsy. After that, he tried to use dental tools, but botched that as well. After an hour or so, Jackson and Walling has a frightened, injured and bleeding young woman on their hands and that’s when the story takes an ever darker turn. The three of them left Cincinnati and traveled across the Ohio River and into Kentucky. Jackson took them to a secluded spot near Fort Thomas and here, he and Walling murdered Pearl Bryan. Using dental instruments, they severed her head from her body. It was a “clean cut”, according to the testimony of the doctor who later examined the body. He also determined that Pearl had been alive at the time because of the presence of blood on the underside of some leaves at the murder scene. Pearl’s body was found about two hundred feet off the Alexandria Turnpike and less than two miles from the abandoned slaughterhouse. As her head was nowhere to be found, Pearl was identified by her shoes. They bore the imprint of Louis and Hays, a Greencastle shoe company that was able to confirm that they had been sold to Pearl Bryan. During the trial that followed, Walling testified that it had been Jackson’s idea to cut Pearl up and distribute her body in the Cincinnati sewers. Only the head was taken, for which Jackson apparently had other uses. Pearl’s luxurious blond hair was later found in a valise in Jackson’s room. Pearl’s head was never found and legend has it that it was used during a satanic ritual at the slaughterhouse. It was then dumped into the well of blood and was lost. Jackson and Walling were brought to trial in 1897 and were quickly found guilty and sentenced to death. William Wood was later arrested and charged as an accomplice. Charges against him were dropped when he agreed to testify against the other two men. According to reports, Jackson and Walling were both offered life sentences instead of execution if they would reveal the location of Pearl’s head. Both men refused. 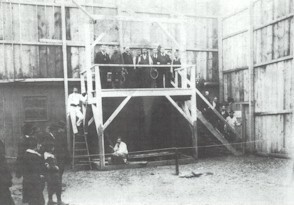 They went to the gallows behind the courthouse in Newport on March 21, 1897. It was the last public hanging in Campbell County. The stories spread that Jackson and Walling were afraid of suffering “Satan’s wrath” if they revealed the location of Pearl’s head. The slaughterhouse was then a closely guarded secret and other occultists would have been exposed if the two men had talked. One reporter commented later that Walling, as the noose was being slipped over his head, threatened to come back and haunt the area after his death. The writer also stated a few days later, in an article in the Kentucky Post newspaper that an “evil eye” had fallen on many of the people connected to the Pearl Bryan case. Legend has it that many of the police officials and attorneys involved in the case later met with bad luck and tragic ends. After the trial ended, the slaughterhouse fell silent and remained empty for many years. It was eventually torn down and a roadhouse was constructed on the site. During the 1920’s, the place became known as a speakeasy and as a popular gambling joint. Local lore has it that during this period, a number of murders took place in the building. None of them were ever solved because the bodies were normally dumped elsewhere to keep attention away from the illegal gambling and liquor operation. After Prohibition ended in 1933, the building was purchased by E.A. Brady, better known to friends and enemies alike as “Buck”. Brady turned the building in a thriving tavern and casino called the Primrose. He enjoyed success for a number of years but eventually the operation came to the attention of syndicate mobsters in Cincinnati. They moved in on Brady, looking for a piece of the action. Brady refused offers for new “partners” and outright bids to buy him out of the Primrose. Soon, the tavern was being vandalized and customers were being threatened and beaten up in the parking lot. The violence escalated until Brady became involved in a shooting in August 1946. He was charged and then released in the attempted murder of small-time hood Albert “Red” Masterson. This was the last straw for Buck and he sold out to the gangsters. It was said that when he left, he swore the place would never thrive again as a casino. Brady committed suicide in September 1965. After Brady sold out, the building re-opened as another nightclub called the Latin Quarter. Several times during the early 1950’s, the new owners of the bar were arrested on gambling charges.. In 1955, Campbell County deputies broke into the building with sledge hammers and confiscated slot machines and gambling tables. Apparently, Brady’s promises had come to pass.It was also during this period that the legends of the building gained another vengeful ghost. According to the stories, the owner of the club’s daughter, Johanna, fell in love with one of the singers who was performing here and became pregnant. Her father was furious. Thanks to his criminal connections, he had the singer killed. Johanna became so distraught that she attempted to poison her father and then succeeded in taking her own life. Her body was later discovered in the now infamous basement… and according to the autopsy report, she was five months pregnant at the time. Bad luck continued to plague the owners of the tavern. In the 1970’s, it became known as the Hard Rock Cafe, but it was closed down by authorities in 1978 because of some fatal shootings on the premises. Finally, the building was turned into the popular bar and dance club that it is today. Bobby and Janet Mackey purchased the building in the spring of 1978 with the intention of turning it into a country bar. Mackey was a well-known as a singer in northern Kentucky and had recorded several albums. He actually scrapped his plans to record in Nashville in order to renovate the old tavern. Once the bar was opened up, it immediately began to attract a crowd. Despite a number of years success with the place though, the good times have never been able to erase the “taint” caused by the history of murder and death. The hauntings at Bobby Mackey’s Music World remain stained with blood. Carl Lawson was the first employee hired by Bobby Mackey. He was a loner who worked as a caretaker and handyman at the tavern. He lived alone in an apartment in the upstairs of the building and spent a lot of time in the sprawling building after hours. When he began reporting that he was seeing and hearing bizarre things in the club, people around town first assumed that he was simply crazy. Later on though, when others started to see and hear the same things, Lawson didn’t seem so strange after all. “I’d double check at the end of the night and make sure that everything was turned off. Then I’d come back down hours later and the bar lights would be on. The front doors would be unlocked, when I knew that I’d locked them. The jukebox would be playing the ‘Anniversary Waltz’ even though I’d unplugged it and the power was turned off,” Lawson told author Doug Hensley, who has written extensively about the haunted tavern.Soon, the strange events went from strange to downright frightening! The first ghost that Lawson spotted in the place was that of a dark, very angry men that he saw behind the bar. Even though others were present at the time of the sighting, they saw nothing. A short time later, Lawson began to experience visions of a spirit who called herself “Johanna”. She would often speak to Lawson and he was able to answer her and carry on conversations. The rumors quickly started that Lawson was “talking to himself”. Lawson claimed that Johanna was a tangible presence though, often leaving the scent of roses in her wake. Odd sounds and noises often accompanied the sightings and Lawson soon realized that the spirits seemed to be the strongest in the basement, near an old-sealed up well that had been left from the days when there was a slaughterhouse at the location. The lore of the area, Carl knew, stated that the well had once been used for satanic rituals. Some of the local folks referred to it as “Hell’s Gate”. Although he wasn’t a particularly religious man, Lawson decided to sprinkle some holy water on the old well one night, thinking that it might bring some relief from the spirits. Instead, it seemed to provoke them and the activity in the building began to escalate. Soon, other employees and patrons of the place began to have their own weird experiences. They began to tell of objects that moved around on their own, lights that turned on an off, disembodied voices and laughter and more. Bobby Mackey was not happy about the ghostly rumors that were starting to spread around town. “Carl starting telling stories and I told him to keep quiet about it. I didn’t want it getting around, because I had everything I own stuck in this place. I had to make a success of it,” he said. He was not one to believe in ghosts or the supernatural and he didn’t want his customers believing in it either. But when Janet Mackey revealed that she too had encountered the resident spirits, Mackey was no longer sure what to think! At the time of this terrifying encounter, Janet was, like Johanna and Pearl Bryan before her, five months pregnant. A coincidence? Once Janet admitted that she had seen the ghosts in the building, other people began to come forward. Roger Heath, who often worked odd jobs in the club remembered a summer morning when he and Carl Lawson were working alone in the building. Heath was removing some light fixtures from the dance floor and Lawson was carrying them down to the basement. Just before lunch, Lawson came up the stairs and Heath noticed that he had small handprints on the back of his shirt. It looked just like a woman had been hugging him! Erin Fey, a hostess at the club, also confessed to encountering Johanna. She had laughed one day at Lawson when he was talking to the ghost. She stopped laughing when she also got a strong whiff of the rose perfume. Once the stories starting making the rounds, they caught the attention of a writer named Doug Hensley. He decided to investigate the stories and started hanging around the club, striking up conversations with the regular customers. No one was anxious at first to talk about ghosts. “When I first talked to these people, almost every one of them refused to be interviewed,” Hensley said. After he talked to Janet Mackey though, many other people came forward. Soon, Hensley had thirty sworn affidavits from people who experienced supernatural events at the club. He continued to collect stories and sightings, intrigued by the various spirits who had been seen, including a headless ghost who was dressed in turn-of-the-century clothing. Strangely, independent witnesses provided matching descriptions of the phantom, never knowing that she had been seen by others. That was when Hensley turned to historic records to shed some light on the building’s past. He was stunned to discover that events of the past were closely connected to the hauntings of the present. In old newspaper accounts, he found the story of Pearl Bryan and photos of Buck Brady that matched the description of an often seen ghost. None of the witnesses to the present-day paranormal activity were even vaguely aware of who these people had been or what connections they had to the building! Hensley has since compiled his stories into a book and has been a part of many of the investigations at the club, including a 1994 exorcism of the place that failed miserably. The activity continues to occur and several individuals have even been physically assaulted by spirits. One customer even tried to sue Bobby Mackey in 1994, claiming that he was attacked in the restroom by a ghost wearing a cowboy hat! The case was later dismissed. Bobby Mackey’s Music World remains perhaps one of the strangest haunted sites in the Midwest and one that has proven to be a major attraction for ghost hunters and enthusiasts alike. Few go away disappointed from a tavern where “spirits served” has another meaning altogether! Click here to download the song Johanna.